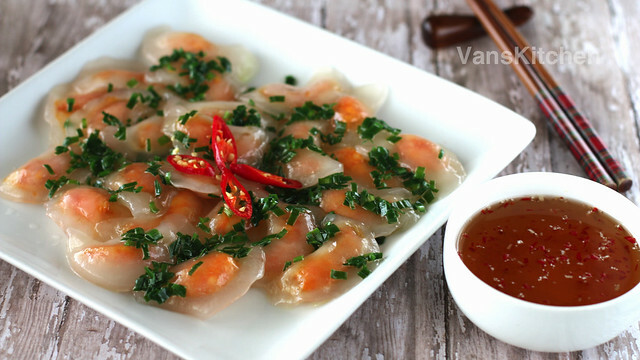 ♥Watch my video how to make Vietnamese tapioca dumplings on Van's Kitchen Youtube. 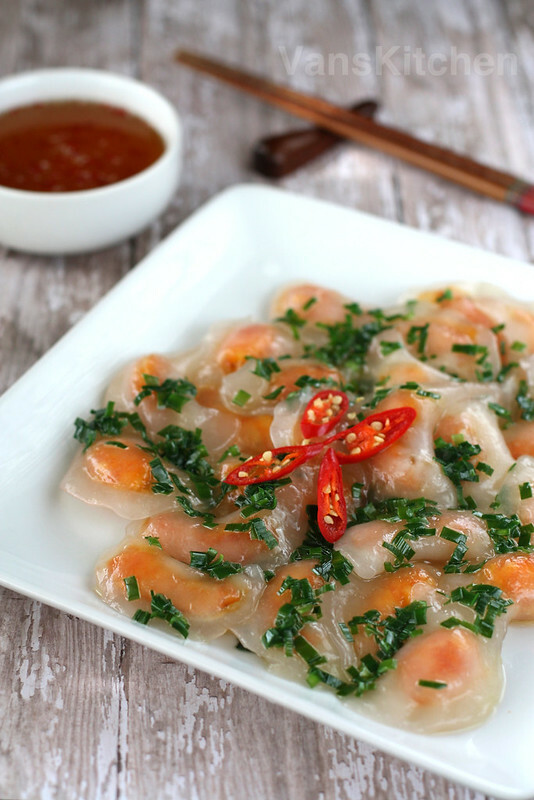 Banh bot loc has been the most requested recipe since I started making cooking videos. It was one of my favorite foods during my childhood in Vietnam. I can still remember having fun making these dumplings with my sister. She always made the dough, and I helped with making dumplings. Of course, we did not have modern conveniences like KitchenAid mixer, so my sister always kneaded the dough by hand. This was also the food I always pretended to make before I could make real food. I substituted grass for the chives, and tried to chop it as finely as possible. It was so much fun! Cut the shrimp tail and all the legs off. Soak shrimps in the salt water. Wash and drain well. Then cut the shrimp in half. If you use big shrimp, it’s better to peel the shell, since the shell is very hard. Mix wel the prepared shrimps with sugar, salt, half of the shallot, garlic, pepper. Cover and let it marinate for 30 minutes. Heat oil in a pan and stir fry the remaining shallot until it smells good and turns brown. Add the shrimp, sear until the shrimp is cooked. Add annatto oil if you want the shrimp to have brighter color. Set aside to cool. Making the garnish: Heat the oil, and when it starts to smoke, pour over the chopped chive bowl. Making the dressing: Mix together the water and sugar until the sugar is dissolved. Bring to a boil, then turn off the heat. Let it cool then add the fish sauce. Stir well. Before eating, add the chili. In a KitchenAid stand mixer bowl, mix well tapioca flour with salt. Add oil, boiling water. Start the machine, add more boiling water if it’s too dry. Let’s the machine mix at low speed first, then raise the speed higher until the dough is elastic and no longer sticks to your hands. If you accidentally poured in too much boiling water and the dough is too sticky, just add a little bit more flour and mix until it reaches the correct consistency. Take a small amount of the dough, roll out the dough and stretch into a strip, then cut it into small evenly sized pieces. Roll each piece into a ball. Take one of the dough balls, start from the edge, and while moving around, flatten the ball out evenly into a circular shape, to a thickness of about ⅛ of an inch. Then put one piece of shrimp into the center of the dough. Fold over the dough, and press the edges tightly to seal. Use a round cookie cutter to cut the edge. Then set on a covered dish. 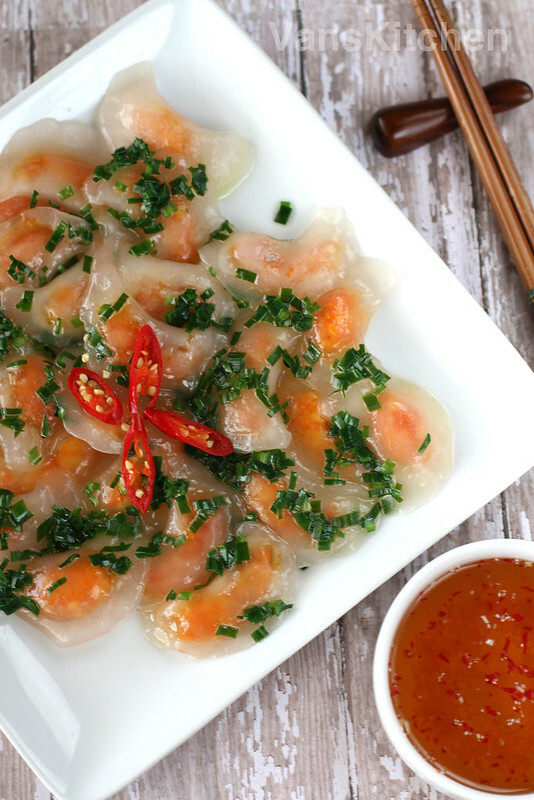 Continue making the rest of the dumplings. Bring a pan of generous amount of water to a boil on medium-high heat. Drop the dumplings into boiling water. Cook for approximately 10 minutes, until the dumplings start to become clear and float to the surface of the boiling water. Leave them like that for a few minutes. Then transfer them into a bowl of cold ice water. The dumplings will become more transparent in the cold water. Drain, and place on a dish for serving. Spread the chive onion oil mixture on the dumplings. Add the dressing and serve.